Schneit es monentan in Angel Fire Resort ?Vielen Dank! Angel Fire Resort in the United States (New Mexico State) is a medium sized ski resort with 7 ski lifts (2 quads, 3 doubles, 2 carpets) that offers skiers an impressive 633 metres (2077 feet) of vertical descent. Angel Fire Resort has 445 acres of terrain over 67 trails. 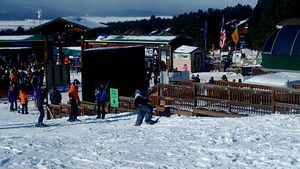 Angel Fire Resort is best suited to intermediate skiers and snowboarders but there is some terrain for beginners and advanced skiers. We have no information about the existence of any cross country ski trails at Angel Fire Resort. For snowboarders, there are 2 terrain parks and a half pipe. Over half of the trails at Angel Fire Resort are covered by snowmaking. The nearest airport is at Albuquerque.